I’m not talking about fake robots. I’m not talking about toys. 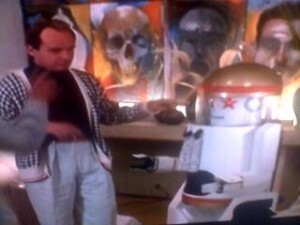 I’m talking about actual ‘high end’ ‘robots’ that were sold to consumers in the 80s. Of course these products weren’t very advanced but they were meant to modernize convenience. What menial task was so horrible that it should be delegated to a robot servant? A waiter, of course! This is what the pinnacle of thinking in the decade of decadence came up with. 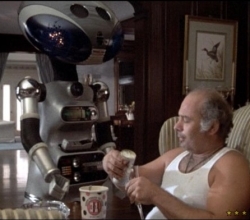 In 80s movies, whenever there is a rich guy who lives in excess you will often see a short scene of a stumpy robot rolling two feet and stopping holding a tray of Coca-Cola. In Rocky IV (1985), the boxer has a lot of money and apparently buys a present for Paulie. Even Wall Street did it. Seriously. Gordon Gekko is at a house party hosted by a rich guy and this little R2-D2 looking thing haphazardly rolls up. How retarded is the concept that it would actually be easier to deal with this half-working drone simply to very slowly give you refreshments? It’s a good thing these big houses don’t have any stairs or furniture in the way to trip up the robots- there’s a good reason why these movies never actually show them doing anything. And even if they worked, I’d like to be the rich guy whose biggest problem is figuring out how to get Coca-Cola out of the refrigerator.